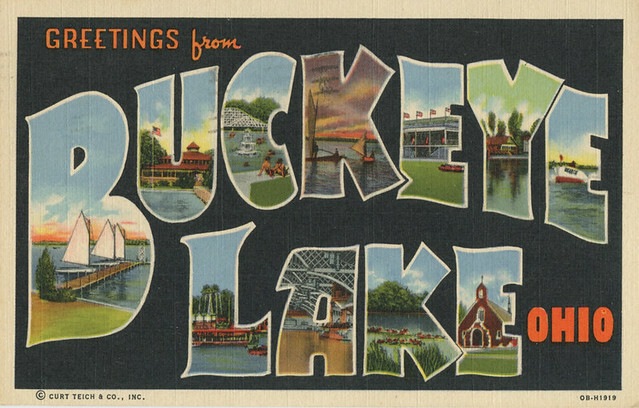 We recently returned from a family reunion/vacation on Buckeye Lake near Columbus, OH. Our second trip out there in the last few years, and it was a lot of fun. The kids are at the age to really enjoy water sports, which were our featured activity each day. This meant early mornings – getting up at 5:30-6:00 EST(!) to make our cast off time, avoid the crowds, and hit the smooth water. It also meant my brother and me had to make our attempts at wake-boarding, to the delight of the kids, since neither of us are very good. The kids caught on quickly, though, aided by the patience of our cousins and their silver and red Buckeye boat (it really is an awesome ski-boat; the best one on the lake), not to mention some surprise instructions by a former professional wake-boarder and friends. Weekends like these are big confidence builders for them; they tried something new, were pretty successful, and had fun. For me, it’s a little strange to be on a lake that’s purely recreational. Our lakes in Illinois usually have dual-hats: flood control, power plant cooling, etc. Lake Shelbyville, where I grew up, is a federally run lake with a flood control purpose primarily. No houses and restaurants at water’s edge, fluctuating water levels, and lots of coves with old dead trees. Couldn’t say which is better, but Buckeye Lake is sure a lot more convenient. The best part of this vacation, though, was the family reunion. Everyone made it back except one cousin, and we all had a genuinely good time together. No major drama, the bigger kids were very kind and patient with the younger kids, and the adults were able to catch up and enjoy the down time. We may have had some early wake-up calls, but the stress levels were low and the food was good, and the weather outstanding. No real Griswold moments with this one, though I’d like to think old Clark would have approved. 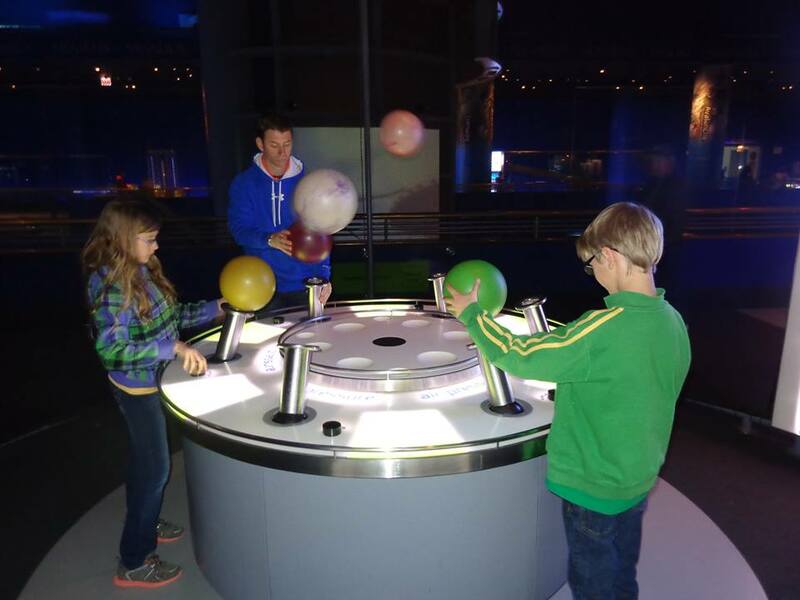 Last week we took in the Museum of Science and Industry in Chicago, which turned out to be the highlight of an otherwise low-key Spring Break for the family. What a place – especially for curious young minds. A lot has changed since the last time I visited this museum (way back in high school). The volume of interactive exhibits and activities is impressive. Seems like everywhere we turned we found another place to do stuff as we learned about it. I remember being excited about going to museums as a kid – I loved to see and read, see and read about the displays. At the Museum of Science and Industry, though, they’re not content with only reaching the readers. As a result, the whole experience seemed more immersive, more kinetic (and certainly a little more chaotic). Trying to stay up to date on the road presents problems. Hotels don’t provide free internet in the room (why is it the more expensive the hotel, the less likely the free internet?). Using a tablet for longform typing = not ideal. Your schedule’s messed up. You may not sleep well. Anyway, more quality coming soon, including a book review and reactions to comicon news. The vacation posts on Beemsville have often tended to be late for a variety of reasons. This summer’s entry saw us traveling to Dallas, TX to visit cousins and my sister. That’s right. We weren’t satisfied with record highs and drought conditions in the home state; those hundred degree days in Illinois were just to get us in the mood. We really wanted to experience early August in North Texas, get the full effect. Yes it was hot, but actually a little cooler than home for a couple of days. The idea of running a half-marathon would have seemed pretty odd a few years ago. I’m not a strong natural runner, and running certainly isn’t a fave for cardio exercise. But with persistent encouragement from some friends and my own stubborn streak kicking in, a half-marathon became my Spring work-out goal. Setting goals and working towards them sounds inherently lame on some levels, and yet the older I get the more I realize how effective this simple motivational structure can be.